Yesterday, I broke the news at Search Engine Land that Google has decided to drop the images and circle counts from the authorship snippets in the Google search results. Yes, he actually wrote, "our experiments indicate that click-through behavior on this new less-cluttered design is similar to the previous one." There are plenty of studies and even Google early on claiming otherwise, including examples from webmasters. But whatever, why would Google lie to us about that? Wouldn't get more clicks than this? Now, this isn't 100% live yet, it is rolling out over the next few days. So you still can benefit from it. Why is Google removing it? Well, it is less cluttered. Truth is, I think Google can't handle the spam issue even after rich snippet reductions. 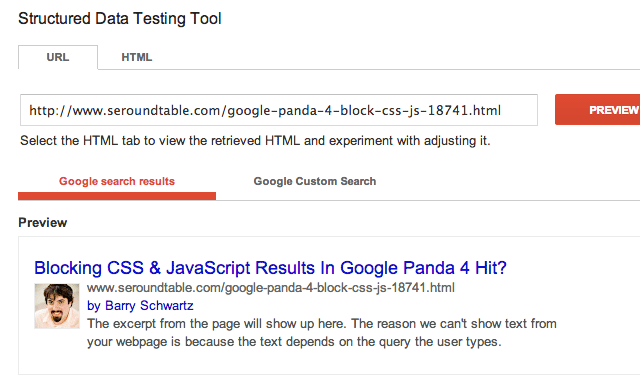 Remember when Google dropped authorship for 75 minutes? I guess that was a real test? As you can imagine, publishers are not happy. There are tons of comments at Search Engine Land and complaints on Google+ and WebmasterWorld. Many in fact are considering dropping it completely now from their markup. But would that be wise? There are signs it may be used in rankings in the future and is currently used for in depth articles. Forum discussion Google+ and WebmasterWorld.